Since 1864, the school of Civil Engineering brings valuable contributions to the development of our society. The roots of the Technical University of Civil Engineering of Bucharest (UTCB) go back in 1864 to the "School of Bridges and Roads, Mines and Architecture". From 1867 this became the "School of Bridges, Roads and Mines" and "the National School for Bridges and Roads" in 1888. In 1921, the "National School of Bridges and Roads" became the "Polytechnic School of Bucharest", where the engineers' training was carried out in the Engineering Department which, in 1938, came to be known as the Faculty of Civil Engineering. 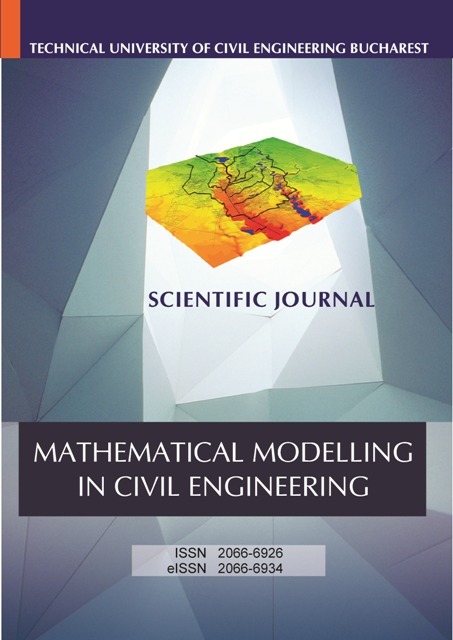 The Mathematical Modelling in Civil Engineering (MMCE) is an UTCB journal. Since 2003, MMCE serves the Civil Engineering community and our societies, aiming to effectively contribute to the development, innovation and progress in the field. MMCE publishes papers that present the state-of the-art results from research and practice. It covers a wide range of topics from Civil Engineering field and is ready to publish, high quality standards, state-of the-art, peer-reviewed papers, coming from the academic and research community, and industry as well. MMCE addresses both theoretical developments and practical applications related to Civil and Structural Engineering, Earth and Environmental Science, Engineering Thermodynamics, Transport Phenomena, Structural Foundations, Hydraulic Engineering fields. To be acceptable for publication in the MMCE journal, a manuscript must address valuable and of significant interest scientific issues for the Civil Engineering community, free of evident commercial or private interest. The authors are requested to make sure that appropriate research ethical standards are strictly followed in their work, when submitted to MMCE. The MMCE staff fully supports the authors during the entire evaluation process and is committed to ensure that the ethical standards, related to submittal, review, and publication of manuscripts, will be strictly followed. The Mathematical Modelling in Civil Enginneering (MMCE) journal is participating in a growing community of CrossCheck System's users in order to ensure that the content published is original and trustworthy. CrossCheck is a medium that allows for comprehensive manuscripts screening, aimed to eliminate plagiarism and provide a high standard and quality peer-review process.